Style statement, fashion victim or essential all-weather family funbus? Just what is the modern, SUV? One thing's for sure, the SUV or 'sport utility vehicle' is a smash hit. People love the raised seating position, that feeling of sturdiness and impregnability, the notion that SUVs will keep on trucking whatever the weather while offering estate-like levels of accommodation and practicality. Increasingly, they also have the hots for the slick styling of SUVs. Today's efforts are a far cry from the boxy, utilitarian SUVs of old. Several now fuse elements of sport saloon, sleek coupe and hot hatch into a pumped up, all-terrain, go-anywhere package. Of course, there's a vocal anti-SUV brigade, too. Will any of these pseudo four-by-fours ever see off-road action, they ask? It's a fair question given how many reside in city centres. Chelsea tractors, indeed. What's more, some don't even come with four-wheel drive as standard, which is a bit of a give away regards the true balance between form and function. SUVs are now available in shapes and sizes to suit almost every budget. So, here's the bottom line. SUVs pack an undeniable feel-good factor that dreary Euro-box hatchbacks, saloons, and estates simply cannot approach. The F-Pace is a very exciting SUV - it's both practical and exciting to drive. If you're after the ultimate driver's SUV opt for the throaty V6 petrol motor (that's the same engine that's found in the F-Type). It sounds great, and it's fast with a 0 - 62 mph time of 5.1 seconds. Best of all? It's packed with technology, from the brilliant InControl Touch Pro system to the semi-automous features and Activity Band key. The new XC90 has won many, many plaudits thanks to its small army of highlights. For example, archaic buttons and dials have been replaced by a cool touch-screen display, it does most of the driving for you thanks to highly autonomous modes and it comes in an insane-and-yet-pleasingly-frugal T8 Twin Engine hybrid version. This latter ace fuses a supercharged 2.0-litre petrol engine with some batteries and motors to produce around 400bhp. It's quick (0-62mph in 5.6 seconds), stylish and can manage a claimed 27-miles on electricity alone. When the batteries run dry, simply plug it in and enjoy some more near-silent cruising. The only downside is it costs just shy of £60,000 but you get a hell of a lot of family transport for that money. If Nissan is credited with kick-starting the SUV craze with its Qashqai, then Bentley should be awarded some kind of medal for raising the bar further. The Bentayga is the world's first luxury off-roader, as well as the fastest SUV on sale (0-60mph in 4-seconds and a top speed of 187mph) and perhaps the most expensive vehicle to ever tackle an off-road course. At this price, many will dub it 'hideously expensive' but this thing really is worth the sticker price. Inside, it's all luxury leather seats, hand-crafted wood veneers and removable Android tablets for rear passengers, but get this thing on a mountain side and it will keep pace with a Range Rover, or stick the 600bhp, W12-engined monster on a race track and it'll be hot on the heels of a Porsche Cayenne. Until Rolls-Royce unleashes its attempt at the millionaire's SUV, the Bentley Bentayga is firmly at the top of the table in terms of build-quality, performance, and outright street presence. Who's the daddy? The Range Rover, of course. It's the original and – you guessed it – still pretty much the best. 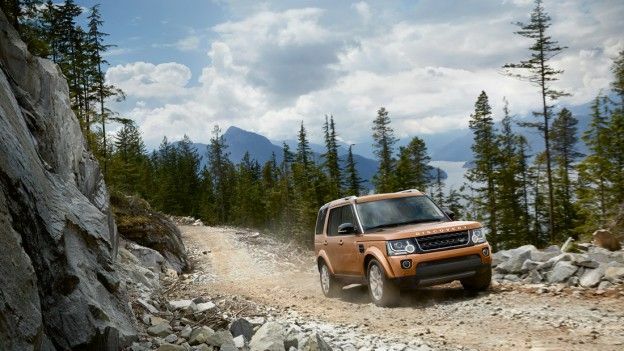 The latest model is all-new and built on a cutting-edge aluminium chassis that shaves a staggering 400kg from the Range Rover's traditional SUV girth. That makes it relatively efficient for such a big beast and lifts the driving dynamics to a whole new level, so it can now compete on near level terms with limos like the Mercedes-Benz S-Class. We recently drove from London to Wales in a Range Rover Autobiography and couldn't think of a better car for the journey. Massage and cooling seats make sure you remain comfortable, and adaptive cruise control and traffic jam assist make driving a breeze. Best of all, it's the only full-sized SUV that's actually elegant. Best of British, right? If you want to go off-road, and we mean properly off-road, you have three options - a Land Rover Defender, Toyota Land Cruiser, or this, a Jeep Wrangler. We have a massive soft spot for the Wrangler here at T3 after spending last Summer in the South of France completing off-road trails in a Burnt Orange Wrangler Rubicon. It's such an impressive machine and has a real character. We've also driven it on the road here in the UK, and was pleasantly surprised with how easy it was to get on with. We took an Unlimited Overland down to Dorset - eating motorway miles effortlessly, and we also drove it into the Centre of London with no problems what-so-ever. You see, the driving position is incredibly high so you get a great view of the road, and all-around visibility is brilliant, with a clear definition of where all four corners of the car are. You can also take the roof panels and doors off for a true convertible experience, and the interior is hard wearing and rugged. Porsche. The world's leading sports car maker, right? Actually, Porsche already makes more SUVs than sports cars by far thanks to the runaway success of the heighweight Cayenne. With the arrival of the new mid-sized Macan, Porsche will officially become an SUV maker with an interesting sideline in sports cars. So it goes. Still, who cares when the Macan is such an absolute revelation to drive? It's easily the sportiest and most dynamic SUV ever made. Think of it more a a huge hot hatch than a small SUV and you'll get the idea. Even the base model gets a gorgeous twin-turbo V6 motor and an interior to die for. Fancy a Porsche Cayenne but don't like the look of the punitive pricing? Was sir perhaps aware that the Cayenne shares its underpinnings and some of its engines with the much more modest-money Volkswagen Toureg? Granted, you loose one of the most aspirational badges in the business and Porsche's sporty chassis settings. But you can keep the engineering integrity and all-round practicality and quality. Even the entry-level model sports the same diesel V6 engine as the much pricier Cayenne, albeit detuned to 201 bhp. The hydrogen ix35 Fuel Cell is so ahead of the game, there are only a handful of places to fill it up in Europe. That's right, the elusive compressed hydrogen, which is magically transformed into electricity by a fuel cell stack to fuel the on-board electric motors, powers it. Drivers can enjoy 133bhp, a 0-62mph sprint in 12.5 seconds and a 389-mile operating range with nothing but water emitted from the tailpipes. Sure, it's super green but it's also not really available to the public yet... and almost impossible to refuel. But yay, innovation! If the BMW X6 M was a movie, the reviews on the poster would read, "The Batmobile on steroids: An absolute hulking, pumping, powerhouse of a machine." The twin-turbo V8 belts out a frankly ludicrous 567bhp and an eye-watering 750Nm torque, meaning the rocket-propelled tank can sprint from 0-62mph in a Porsche-teasing 4.2 seconds. It actually handles like a race-honed machine too, and that's thanks to the fact that BMW's revered M division have tweaked the xDrive all-wheel-drive system and suspension set-up to deal with the occasional track day. This car is not for shrinking violets, or those looking to scrimp on the fuel bills, but it is a hell of a lot of fun and surprisingly lavish inside. The Countryman All4 is a genre-busting mash-up of the highest order. It's part-hatchback, part-pumped-up SUV and all Mini. Sorry, we refuse to call it MINI; that just looks like we're shouting. The Countryman makes use of the brand's all-wheel-drive system, offering some peace of mind to those bulbous Mini-lovers living in snow-stricken areas. The four-wheel-drive fun extends to the John Cooper Works model, which features a turbocharged 1.6-litre engine that develops around 215 bhp. Of course, you also get Mini's madcap interior touches, including the recognisable circular infotainment housing and neat lighting touches. SUV as fashion statement starts here with Nissan's natty Juke. For visual clout, the outrageous wheel arches, grinning grille and high-fashion headlights deliver immense bang for buck. It's infinitely more interesting than a generic white-good-on-wheels Euro hatchback. It's distinctive inside, too, and has a recent tech upgrade bequeathed a touchscreen multimedia rig complete with Google Send-to-Car support. It's pretty practical as well, with plenty of luggage space and that all-important raised seating position. In summary: walk, don't run, to your nearest Nissan dealer. Jump inside and you'll be pleased the Edge is as big as it is. Plenty of room for the 2.5 kids in the back, boot space for days, and up front mum and dad can enjoy the comfort of the generous seats and spacious cabin. Audio is provided by Sony, Ford's Sync 2 system is a solid performer on the 8-inch touchscreen, and it's worth splashing out for the Sat Nav which is one of the best manufacturer-included offerings on the market. The Edge only comes in diesel, and there's a choice of a manual or automatic. The auto provides the smoother ride, and more power – and was our favourite when we took both models for a spin. Plug-in giants seem to be the flavour of the day and Mercedes' offering is the German marque's first real stab at a large hybrid SUV. It's not a bad debut either, as the made-over ML model manages to remain adept at the muddy off-road capers, yet cruises the streets in sumptuous comfort. The eye-watering £64,995 price tag pays for the 85kW electric motor and 8.7kWh lithium ion battery pack, as well as some cool tech. For example, a GPS-based monitoring system determines the most suitable drive mode for the conditions. It will use juice from the batteries when it climbs a hill, as it knows it can harness power from regenerative braking on the way down. Clever clogs. If you've ever gawped at a Fiat Panda and thought, "that would look great with some off-road bodywork," then you're in luck, as the Italian marque has done just that. Much like the Panda 4x4, this rugged little off-roader is designed to be able to sneak into inner-city parking spaces during the week and traverse the odd mountain at the weekend. The approach and departure angles are impressive, while a clever Terrain Control located between the front seats allows the driver to select the perfect amount of torque and grip for different surfaces. There's Blue & Me Bluetooth and USB connectivity inside, which is powered by Microsoft and works in conjunction with TomTom 2 Live for real-time traffic information. The tiny 875cc Twinair engine does a pretty good job of dragging the Tonka Toy exterior over rough terrain but there's a more powerful diesel if you're more into the long motorway journeys. Okay, so clearly there are a lot of strong emotions around this car, a lot of people think it's preposterous, but believe us when we say - we spent a sunny day driving this along the South Coast, and it is surprisingly great fun. The original Evoque is the style-led SUV that started it all. There's nothing hugely innovative about the Evoque from a technical perspective, what with the generic four-cylinder engines and torque-converter gearboxes. However, what the Evoque does is wrap it all up in an impossibly desirable package. It looks like a sci-fi flick refugee. As it happens, it also drives very nicely, sports Range Rover's trick traction control systems and optionally offers one of the best sounds systems in the business. The Evoque Convertible does come packing JLR's excellent new InControl Touch Pro infotainment system, we think is one of the best out there. If you're worried about safety - don't be - when the Convertible senses you're going flip - two pillars eject from behind the rear passenger seats and the weight of the car can support on the A-pillars.